I’ve always appreciated how well Father’s Day is timed with the summer growing season. My dad has always had a green thumb, lovingly caring for our yard, flower beds, and our vegetable garden. Tools and other gardening gifts have always been perfect for Father’s Day. 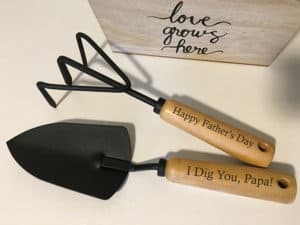 If your dad also loves to sink his hands into the dirt and spend hours creating the perfect garden oasis, he’d love a gardening gift for his special day. Here are some practical, fun, and creative gifts for your gardening father. They’re also great for birthdays, anniversaries, and even Christmas. Whether your dad is getting a little slower in old age or you just want to give him the gift of easier yard work, this power assist wheelbarrow is a fantastic gardening gift for Father’s Day. Your dad can haul loads up to 200 lbs. with eas thanks to the battery operate drive system. It has easy to use pushbutton controls for forward and reverse movement. Haul dirt, gravel, and heavy plants with ease. Your dad will love it if you spoil him with the awesome wheelbarrow. If your Dad also enjoys cooking, he probably appreciates growing his own fresh herbs. Now he can grow them year-round in this gorgeous, personalized planter. Etsy seller North Idaho Concepts handcrafts these rustic window boxes that are perfect for growing herbs in a kitchen windowsill. When you order, you can have the planter customized with any name or message. Creating a meaningful gift for Father’s Day that your dad will enjoy for years to come. Help your dad avoid sun burn and get a little extra shade with this attractive hat from Columbia Sportswear. Perfect for those long afternoons spent mowing the lawn or weeding the yard, this comfortable hat provides shade and 50 UPF UV protection. The omni wick sweat band helps him stay cool in hot weather and the chin strap keeps the hat firmly in place no matter how windy it is. 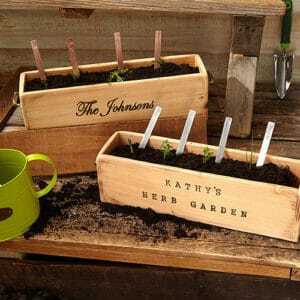 This is a thoughtful and practical gardening gift for dads. If your dad is always battling weeds and dandelions in his garden, he’ll really appreciate this gift. A weeder like this Fiskars 3 Claw Garden Weeder is the easiest way to permanently remove weeds without using harmful chemicals. Just place the claw around the weed, press it in with your foot, pull back and it yanks the weed and its roots from the ground. This is great to use in vegetable garden beds as it takes care of the weeds without disturbing your plants. Dad will appreciate how easy it is to use, plus it prevents back pain since he can stand up to use it. Learn more about how to get rid of dandelions. This is a fun gift for gardener dads to claim what’s theirs. 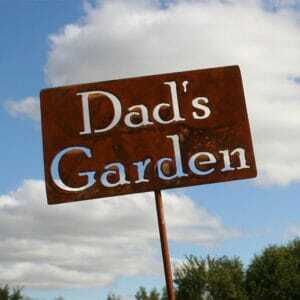 81 Metal Art makes a variety of garden signs from rusted steel, that have a rustic look that changes with time. Customize the garden with your Dad’s name, or choose from “Dad” “Papa” and “Grandpa.” Available in three sizes, you can find the perfect one to match his garden size. There are so many tools that make gardening easier. If your Dad doesn’t have a nice set of pruning shears, you should buy him some ASAP! Pruning shears are perfect for pruning plants, harvesting tasty veggies and herbs in the garden, and trimming off dead leaves and branches. These professional pruners can cut branches up to 3/4″ in diameter. They’re perfect to add to your father’s tool collection. Check out more common garden tools and their uses for more Father’s Day gift ideas. If you think regular garden tools are too impersonal, you can get your Dad something really special instead. All About Impressions makes personalized garden tools with engraved handles. This set comes with a hand trowel and a cultivator, the perfect tools for any traditional garden bed or even container gardens. These tools have steel heads with a hardwood handle that is laser engraved with your special message. Personalize it with your dad’s name, an inside joke, or just messages of love and appreciation. This funny gardening t-shirt is the perfect gift for dads with a sense of humor. It says “Hanging with my Hoes” and features an illustration of a garden tool rack. This shirt is cheeky and perfect to wear for an afternoon working in the garden. 100% cotton. Also available as a hoodie. A nice pair of work gloves make yard work and gardening so much easier. All dads will appreciate this affordable Father’s Day gift. Made with a suede cowhide palm and palm patch, these gloves provide a firm grip while protecting your hands from cuts and calluses. The knit cuff protects your wrists and keeps debris out of of the glove. If your dad likes to use technology while he gardens, check out these touchscreen gloves for gardening. This electric wood chipper and shredder makes a fantastic gift. I love it because it provides two benefits: it helps your father clear the yard while creating free mulch for his garden. This chipper can shred branches up to 1.5″ thick and is easily portable for any location in your yard. Easy to operate it comes with a 2 year warranty. Looking for more gift ideas? Check out these gifts for gardeners and kid gardening gifts.